If you or someone you know has cold feet and a sense of humor, consider getting a pair of novelty slippers as a gift. These are also great for you to wear to show off your personality. Check out different styles and find out where you can buy them. You can find fun slippers at most major retailers in the shoe or accessories section. If you're considering an online purchase, here are a few places to browse for unique slippers and get more ideas about your choices. Jessica's Unique Gifts: If you're looking for animal or bug slippers, this shop offers one of the biggest collections. You'll find ladybugs and butterflies, frogs, pigs, dogs, koala bears and much more. Bunny Slippers: The website offers a wonderful selection of novelty slippers for the entire family, including superheroes, animals, monsters, sports teams, and characters. Think Geek: Here, you'll find fun novelty slippers inspired by Chewbacca, monsters, Pokemon, unicorns, dragons, and more. Happy Feet: This shop offers the most unusual collection of novelty slippers you're likely to find anywhere, from animals to sports teams, Dreamworks characters to indoor-outdoor slippers that look like plush sneakers. Fun Slippers: Fun Slippers is your one-stop shop for all kinds of novelty-type slippers, including animal styles, funny slippers, plush designs, and even slippers in extended sizes and for couples. Hayneedle: This shop carries slippers for men and women, but their collection of men's sports team slippers is one of the best you'll find. There's no shortage of novelty slippers, and they come in just about every style available. Here are some of the most popular categories, but they are only a fraction of what you can find either online or at brick-and-mortar shops. Animal slippers come in half slipper styles as well as full slippers, and they typically have animal heads attached to the toes. Here are a few fun examples. Classic bunny slippers: Bunnies have to be the classic of all animal slippers. This pair is available in men's and women's sizes for about $30. 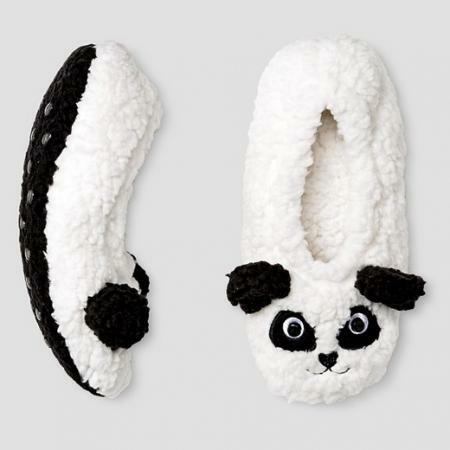 Bear slippers: Target offers adorable panda bear slippers for kids in sizes Sall/Medium for under $10 (shown below). Bunny, lamb, elephant, or unicorn: Pottery Barn Kids has a selection of plush slippers that fit children up to 12 months old for just under $20. Kids animals slippers at Plushies Everywhere area available in a wide range of styles, including turtles, fish, cats, and puppies. These range in price from less than $15 to about $30. Slightly different from other animal slippers, paw and claw slippers are oversized versions of different types of animal paws or feet with claws. Not only are they funny, they'll keep your feet incredibly warm because there's so much insulation. 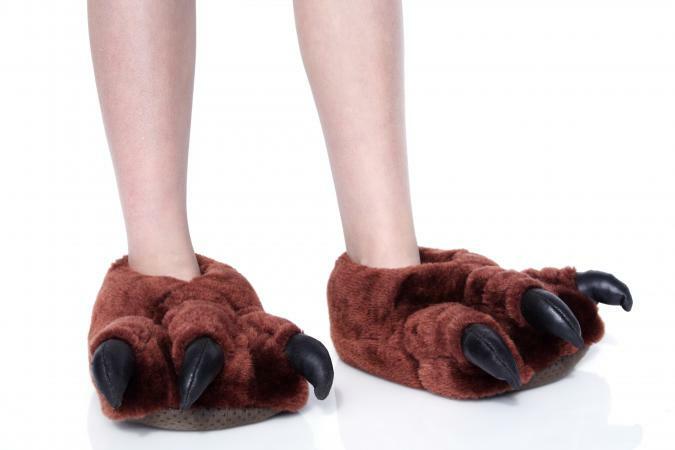 Bear paws: Feel like a grizzly bear in these slippers (below). Sizes are available for kids and adults, starting at $25 and up depending on size. Dinosaur claws: These sharp-looking pink slippers come in women's sizes for just over $20. Black bear paw slippers: These slippers are available in sizes for men and women for about $25. This group includes favorite characters from cartoons, movies, TV shows, and even comic books. Here are some popular styles. Hello Kitty: This cute little kitty appears on a wide range of girl's products, including these slippers by Minnetonka, so they are perfect for indoor or outdoor play. They come in little kid sizes seven through 13 and big kids size one through 4 in black, pink , or tan for just under $40. SpongeBob SquarePants: Amazon offers these slippers of everyone's favorite goofy sponge. They're available in sizes for kids (about $15) and adults (just over $20). Power Puff Girls: Spencer's offers Blossom, Bubbles, and Buttercup slippers, but they're only available online. One size fits most and they are sold for around $11. Mickey and Minnie Mouse: The Disney store has Mickey and Minnie slippers for kids that offer a comfortable fit for just under $15. Here are some innovative slippers that do double duty. Read any customer reviews offered for these slippers to find out whether they work as well as advertised. Mop slippers: Believe it or not, you really can dust mop your floors with these slippers because the soles are covered in microfiber fingers. The company offers them in women's sizes, and they are machine washable. What's even better -- they are very affordable at about $7 per pair. Heated slippers: Heated Mouse offers slippers that connect to your computer via the USB drive. These are available at about $30 per pair. Massage slippers: Hammacher offers gentle massaging slippers in adult sizes small through extra large for about $25. Here are a few tips to keep in mind when you're giving slippers to someone else. Try to find out that person's shoe size. This will help you determine which size slipper you need. Also be sure they don't have a special need for shoes with significant arch support (most slippers are relatively flat). Look for non-skid soles whenever possible. Slippers with standard cloth bottoms offer little-to-no traction on slippery surfaces. Make sure the style is appropriate for where it will be worn. Most novelty slippers are made strictly for indoor use, but some do have rubber soles so they can also be worn outside. Be sure the person you want to buy a pair of these slippers for will actually appreciate them. While some people love these slippers, others might feel silly wearing them. Novelty slippers offer a fun way for people of all ages to keep their feet cozy. Now that you have an idea of just how many styles are out there, enjoy searching for the perfect pair for everyone in your family.